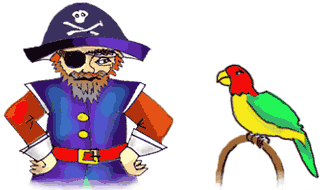 THE WRECK OF THE SEASLUG - more adventures with the pirates and the parrots! A free story to print or download. "This is the life!" squawked Neptune the parrot. He perched on top of the mast, swaying happily as the fishing-boat rocked on the waves. The sun was shining, the fishermen were singing and he had a belly full of ship's biscuit. "Stone the scabby crows, you're right there, matey!" said Liana, his parrot partner. She had learnt pirate language from Neptune. Once Neptune had been a pirate's parrot, sailing the high seas. Then the pirate ship, the Seaslug, was hit by cannonballs and went gurgling down to the bottom of the ocean. So now he lived on Parrot Island, but he and Liana often went for trips on a friendly fishing-boat. Suddenly Afa the fisherman stood up and peered into the distance. "Ship ahoy!" he called. "That's a funny ship!" he said. "What are all those strange things on its deck?" "It's a salvage boat," said Liana. "Those are pulleys and winches. They pull up shipwrecks from the bottom of the ocean." "Really? I must go and take a look!" exclaimed Neptune. He flew across the sea and fluttered high over the salvage boat. Down below, he saw divers carrying ropes and hooks. They jumped into the waves and disappeared. He saw sailors getting ready to wind up the winches. And then he spotted somebody who made his blood run cold. Neptune nearly fell out of the sky with shock. "Pieces of eight!" he gasped. "It's blinking, stinking Captain Snatchit!" The Captain looked unusually clean and respectable. He wasn't wearing his pirate hat - but it was him all right. He was standing next to a sea-chest full of gold pieces. "He must have robbed the sailors!" Neptune thought. But then he heard the Captain bellowing at the salvage crew. "Get a move on, you mouldy molluscs!" he roared. "Haul my ship up! What am I paying you for, you weedy worms? Pull harder!" "Don't swear at my men like that!" the salvage captain told him. "Er, sorry," grunted Captain Snatchit. "I'm just so excited at the thought of seeing my dear old ship again." The men pulled and heaved on the winches. And very, very slowly, Captain Snatchit's pirate ship, the old Seaslug, was hauled up to the surface. It was draped in seaweed. Water poured out of the holes that the cannonballs had blown in it. An octopus that had been living there wriggled out and sploshed into the sea. "At last!" Captain Snatchit rubbed his hands. "Now, tow it to land for me!" "That'll cost you extra," warned the salvage captain. "I've got a sea-chest full of gold, you scurvy sausage!" roared Captain Snatchit, turning as red as rhubarb. Then he took a deep breath, wiped his brow and added, "Sorry. I'm just upset at the state of my dear old ship. If you'd be so kind, please sell me two of your delightful cannons." "What do you need cannons for?" "Oh, er - just in case I meet any pirates," said Captain Snatchit. "If you'll give me the cannons, and take my ship to Parrot Island, then all this gold is yours!" "Parrot Island?" squawked Neptune. "Oh, no!" For that was where he lived with all the other parrots. As the salvage ship began to move, he flew behind it. The ship towed the soggy wreck of the Seaslug into a small bay on Parrot Island. Neptune hid in a tree to watch. Once the Seaslug was safely anchored in shallow water, the sailors unloaded two shiny brass cannons and left them on the beach. "Here's your gold!" cried Captain Snatchit. He emptied his sea-chest, pouring piles of coins onto the deck. Then he quickly jumped ashore and the salvage ship sailed away. 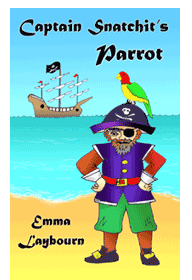 No sooner was it out of sight than he pulled his pirate hat out of his pocket and rammed it on his head. He yelled, "I know you're there, you snivelly sardines! Come out of hiding!" Neptune jumped. For a moment, he thought the Captain meant him. But then, creeping out from behind the rocks, came pirate after pirate. "Shiver me terrible timbers!" wailed Neptune. The whole pirate crew was there. They had arrived secretly at night in their little lifeboat and waited for their Captain. "Well, get to work, you lousy limpets!" roared Captain Snatchit. "We've got a blistering boat to mend. Once it's ready to set sail, we'll use this island as our base." "Base for what, Cap'n?" asked one of the crew timidly. "For pirating, of course! We'll hide here and lie in wait for passing ships. Then we'll sail out and rob them. Boys - we're back in business!" "We'll have to get rid of them!" said Neptune. The parrots were holding a meeting in the trees. Down on the beach, the pirates were busy sawing and hammering as they mended the Seaslug. Captain Snatchit was yelling as usual. "Hurry up and chop more wood, you rotten radishes! Build me a cabin! Cook me a monkey!" Half a dozen pirates dashed into the forest and began to chop down trees. Luckily, the monkeys had already vanished to the far end of the island. So the Captain had to eat pilchards and ship's biscuit for his tea. It did not improve his temper. Even Neptune blushed to hear his curses. "We've got to drive away these awful pirates!" he squawked. "Don't worry. 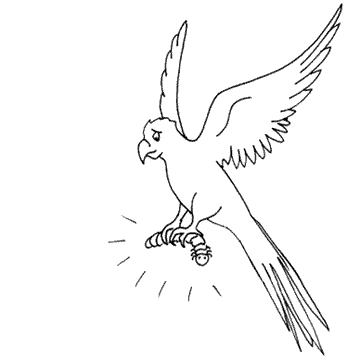 We'll do the same as we did last time," said Monu, the oldest parrot. "We'll shriek and swear at them until we scare them off." "That won't work!" groaned Neptune. "Captain Snatchit knows it was me who taught you how to swear. He won't fall for it a second time." "Then we'll scupper the pirates' boat," said Monu. "We'll fill it with holes so it'll never sail again." "That won't work either!" squealed Neptune unhappily. "If we do that, they'll never sail away! We'll be stuck with them for ever!" "Anyway, we can't peck holes in a boat," Liana added. "It took cannonballs to sink it last time. We don't have any cannons - but they do!" Monu shrugged. "Then we'll just leave the pirates to it, until they sail away." "Don't you understand?" shrieked Neptune. "They'll keep coming back! This is their pirate base now! Shiver me timbers and swallow a squid. We're really stuck!" He began to jump up and down on his perch and flap his wings in his dismay. "Calm down, Neptune," Liana said. "You solved the pirate problem for us last time. You can do it again." "Well, let me see... You must have met lots of human women and children on your travels," she said. Neptune thought about it. In his pirate life on the high seas, he had hardly met any women, and no children at all apart from a Cockney cabin boy. But he didn't want to admit this to Liana. So he said, "Oh, yes! Loads!" "So you know what they sound like?" Liana took off and fluttered into the jungle. The other parrots flew after her, bewildered. "What on earth are you doing?" asked Neptune, as she landed on a dead tree and stuck her head into a hole in the trunk. "I'm looking for some very small friends of mine," came her muffled voice. "They're going to help us get rid of those pesky pirates." "Friends? In there? She's going crazy," said Monu. "Oh, and we also need to gather lots of leaves," Liana added. "Totally crazy!" Monu shook his head. "Liana's not crazy," Neptune squawked. He stuck his head into the hole to see what she was looking for. Captain Snatchit was snoring in his newly-built log cabin. All the other pirates were snoring on the beach. What with mending the Seaslug, and building the Captain's hut, they had no chance to make any cabins for themselves. So in the middle of the night, when cries for help rang out, they were woken up at once. They all jumped up and looked out to sea. The cries were coming from across the waves. They could see lights flickering out there in the darkness. "It must be a scabby boat! We'd better wake the Cap'n." They banged on the cabin door. "What is it, you droopy dishrags?" yawned Captain Snatchit. "There's a ship in trouble, Cap'n! We can see lights out to sea, and hear shouts for help!" "Hurrah!" cried the Captain as he bounded up. "Man the Seaslug! Get ready to set sail!" The pirates hauled the newly-mended ship into the water. They jumped on board and sailed out of the bay. Leaning over the side, they strained their eyes to see the ship. Sure enough, there were faint flickering lights ahead in the outline of a boat. "Excellent! It's a big one!" said the Captain greedily. Then they heard high voices crying out for help. "Oh, woe is me! Oh fiddle de dee! Our silly old ship is sinking and my lovely lace gown is getting all damp!" "Oh, piff and puddle! My gold necklace is about to fall into the nasty horrid water!" "Oh boo and hoo! Have pity on a rich lady! Who will save my beautiful strings of pearls from drowning?" "Rich ladies!" gasped Captain Snatchit. Like Neptune, he had never met many ladies of any sort. "Cor blimey, guvnor, we're all done for!" "And a cabin boy!" grinned the Captain, totally convinced. "They'll be easy pickings. There's treasure a-plenty for us on that ship! We'll go on board and rob the lot!" The Seaslug sailed towards the lights. "Don't worry, ladies!" yelled the Captain. "We're coming to rescue you!" But then, to his alarm, they screamed back shrilly. "Who's there? I bet you're horrid pirates! Don't come any closer or we'll fire!" "Curses!" snarled Captain Snatchit. He began to chew his beard. "They're armed. But I want that jewellery. We'll smash their blistering boat to bits - and then pick up the pieces! Fire the cannons!" The parrots were nearly exhausted. They were fluttering above the waves in the outline of a ship, carefully carrying glow-worms in their claws. They were hoarse from screeching like rich ladies, just as Neptune had taught them. And now they were worried that they were about to get blown up. "They're going to fire the cannons at us!" wheezed Neptune. "Good," said Liana. "That's exactly what I want to happen. The other parrots should have done their job by now." The pirates pounded across the deck to the cannons, which were loaded and ready to fire. But in the darkness, nobody had noticed dozens of parrots landing on the Seaslug with leaves in their beaks. No-one had seen the parrots stuffing the leaves down the barrels of the brand new cannons. They had not glimpsed the parrots as they flew away again. "Fire the scabby cannons!" yelled the Captain. There were two enormous explosions. All the pirates fell over. With their barrels blocked, the cannons had backfired. They blasted a huge, ragged hole in each side of the Seaslug. 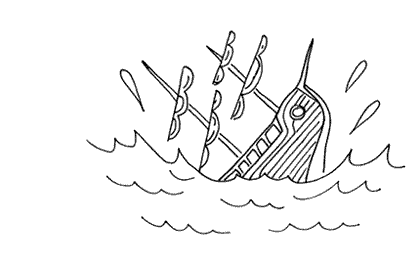 With a groan and a glug, the ship rolled slowly over and began to sink for a second time. And ten minutes later, it was back down at the bottom of the sea. Neptune flew over to inspect the wreckage. "Your plan worked, Liana!" he squawked. The pirates were swimming around in the dark. Captain Snatchit was clinging to a piece of driftwood and cursing horribly. "Can't you even fire a pair of cannons properly, you goofy gumboils?" "It's all right, Cap'n," spluttered a pirate. "Here comes a scabby ship! We're rescued!" "What?" squawked Neptune. "Rescued? Oh, boo and bother!" Another ship was ploughing through the waves towards them. And this one was a real ship, lit up by torches, not a pretend one made of glow-worms. "That's the salvage ship!" exclaimed Liana. "What's it doing here?" "It must have heard the cannons," Neptune said. The salvage captain shouted, "Get those men on board!" Neptune groaned. "Fry my feathers and griddle my gizzard! Now they'll pull the Seaslug back up to the top again. All our effort was for nothing." Soon Captain Snatchit and his crew had been hauled out of the water. They stood dripping on the deck. "Good timing!" grinned Captain Snatchit. "My boat's down at the bottom of the scabby sea. You can bring it up again!" But the salvage captain glared at him. "We've been looking everywhere for you," he growled. "You know that gold you paid us?" "What about it?" said Captain Snatchit, looking shifty. "Fake - every last coin!" roared the salvage captain. "We're not rescuing your ship this time. We're clapping you in irons and taking you to jail!" And they began to tie the pirates up in chains. As the ship sailed away, the parrots could hear Captain Snatchit shrieking. "Oh, woe! Boo hoo! Have pity on a poor old pirate!" Slowly his shouts faded into the distance. "Now that's what I call a good night's work," said Liana, as the weary parrots flew home to their island. They carried the glow-worms back to the hole in the dead tree. Then they settled down to rest, just as the sun was thinking about rising. It laid a shimmering golden path across the peaceful sea. And far beneath the waves, a happy octopus was moving in to a comfortable new home in the wreck of the Seaslug.